A number of Global Xchange Team 79 volunteers (Sonu, Isaba, Ety, Sampa, Tonni, Anerin, Michael, Shabbir and I) prepared and presented Diwali – major Hindu festival – to Keiss Primary School children. Diwali or Festival of Light is an important sacred tradition that is joyously celebrated all over the world with dominating countries being Bangladesh and India. It is known as “Festival of Light” because in Hinduism light signifies righteousness, wealth and prosperity. Presentation involved the relevant Bangladeshi volunteers giving a brief introduction about themselves and which district of Bangladesh they belong to as well as explaining the significance of their national dress such as Sari, Threepiece and Punjabi. 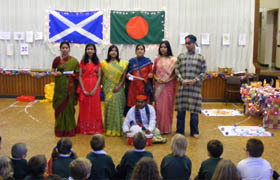 Following this was an introduction to a concise story of “Rama & Sita” that was performed by five children to demonstrate the significance of Diwali to an audience of Keiss School children, staff and parents who were able to attend the performance. The incentive of this day was to fundamentally raise awareness of other religious beliefs and rituals. Although the Bangladeshi volunteers were in attendance to illustrate the holy festival of Diwali, individually they come from diverse religion ethnicities such as Islam, Christianity, and of course Hinduism. This is to demonstrate that we can all – young and old, men and woman, rich and poor man – co-exist with one another in harmony and peace. Guaranteeing freedom of religion is an atmosphere of acceptance and an important role of Human Rights. This deity festival ultimately brought a sense of understanding and enjoyment to Keiss School children and perhaps they will grow up with a better awareness and tolerance towards Diwali rituals and other religious practices. On 11th November, coincidently also the date of two team birthdays and remembrance day, we embarked early in the morning in a brand new, automatic-doored, community minibus. We were first shown a short dvd on climate change and the use of wood, a real eye-opener for some, and also a more lighthearted dvd on the benefits of the forests, such as mountain biking. We buddied up and armed with shovels and bags of tiny Christmas trees we learnt the tricks of the trade. Much laughter was had in the mud and sunshine, amongst the rain showers and rainbows. Our backdrop was great and our cause even greater. We all felt a worthwhile day was spent doing something sustainable and enjoyable.